Bit behind on my blog posts at the mo!! Been so busy! 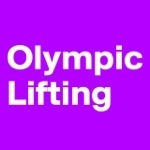 Oly lifting on Tuesday evening. A technique focused class. Working on the second pull of the clean, getting a good triple extension and explosive upright row. Then working on the catch. In the last 15 mins we worked on the technique for the jerk, building up a little weight over last few sets. My lifts are really starting to come along!